Madeira is a fortified wine made in the Portuguese Islands of Madeira, off Morocco, in the African coast. Madeira is produced by being gradually heated for a period of time and then being allowed to cool down. The wines are classified based on age as: Fine (3-5 years), Reserve (over 5 years), Special Reserve (10 Years), Extra Reserve (15 years), and Vintage or Frasqueira (20 years). The style ranges from Dry, Medium Dry, Medium Sweet or Sweet. 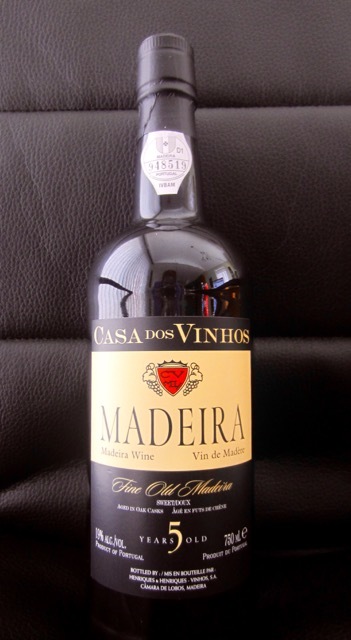 Fine old Madeira is a fortified wine, aged in oak casks for five years. It has amber copper colour and is 19% alcohol by volume. The wine is sweet, with balanced and crisp acidity, dried fruit and burnt sugar flavours with hints of ‘rancio’ and a long, warm finish. Aroma: Rich, baked/smoke, mincemeat, toffee and butterscotch. This wine is perfect served as an aperitif, on the rocks, with a twist of lemon. It can also be served as a dessert wine with cheeses, cakes, fruit compotes or rich puddings. Best of all: Madeira keeps its wonderfully distinctive aroma and taste for months after being opened. Fine old madeira can also be used in marinades and sauces. A spoonful of fine old Madeira enhances soups, stews, fresh strawberries or pineapple. Madeira is mostly taken as an apéritif (before-a-meal) and digestif (after-a-meal). Sweet ones are better for dessert, after the meal. Because it has a very high acidity, Madeira can be paired with any food. Me too. I cook with one 3-4 times a week!!! I love making chicken and asparagus with a Madeira sauce. Chicken really goes well with fortified wine!